Having several people from the Final Fantasy series and add in many of Disney’s best love villains, princesses and heroes and you have a perfect formula for any RPG gamer. 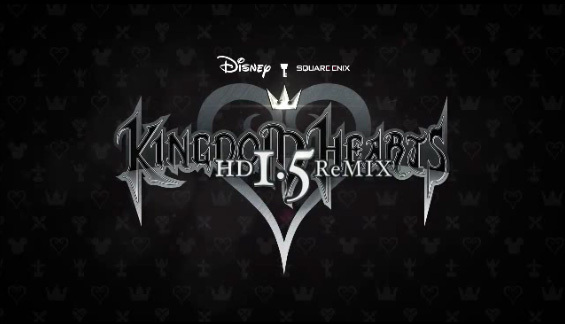 Kingdom Hearts HD 1.5 Remix has two games in the collection Final Mix and Chain of Memories and the CGI cut scenes for a third game 358/2 Days. The games were first put out on the PS2, Game Boy Advanced and the Nintendo DS. This is a 3rd person action RPG and many of the elements work well together but some of the original problems that plagued the first game in the series are still here but it does make more of a positive impression over all when it is all said and done. We played the games in order starting with Final Mix. This is the first chance that a U.S. audience can play this version of the game. Now scenes are added to clarify the story and some new bosses and extra stuff are also here. 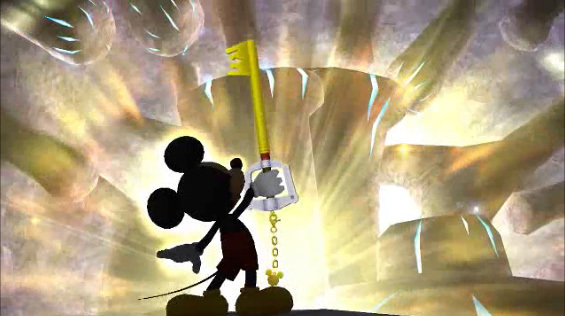 This is an updated version of the first Kingdom Hearts game. We enjoyed hearing for the first time a voice for some of our favorite Final Fantasy characters. The voice acting gets even better with many of the original people come back to play the Disney voices from the movies we grew up with. There is also something satisfying about destroying the villains. The biggest problem here is the camera. It shakes all over the place it is hard to see what is going on and it makes the combat way more difficult than it needs to be. The controls are sloppy because of the camera, also it becomes a pain sometimes just to do a simple attack. There is one water level and it is also clunky mess. We wished that in a HD upgrade they would have fixed the camera issues but no. At least there is a target lock on that makes things easier but it is not a real fix. Many times in the game you have no idea where to go or what to do. You just get lucky and walk into the right area. Also, the bosses are very difficult because of the camera, its hurts replay and doing extra side missions. Chain of Memories picks up right where Final Mix leaves off and fixes most of the camera and control issues plus adds a card battle element to the combat. At first we did not like the card battle system because if you run out of cards you could not attack, use magic, or use items. As the game moves forward and you start to get better cards and find out combo moves it really adds something different to the game. It was surprising but became a welcome change. The game does use the RPG cliché of people losing their memories and recycles some of the sub-storylines directly from Final Mix but the main story is nothing but Final Fantasy goodness. A secret group called “The Origination” it trying to stop Sora, Donald, and Goofy from making their way through a mysterious castle. The main combat gets a little boring and repetitive but there are a lot of boss battles that are challenging and makes you thing about how to set up your deck of cards to fight them. Many of them take more than one try. We wished that there was more voice acting, you do have to read to much and most of it has nothing to do with the story. Chain of Memories is much better than Final Mix so play Final Mix first. 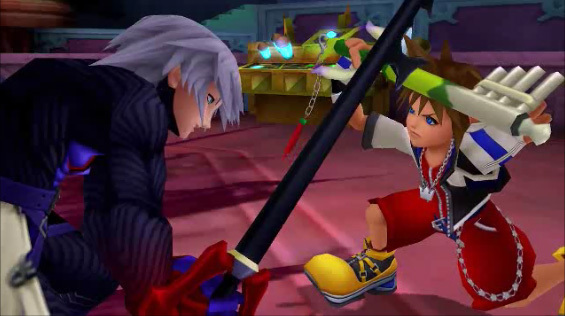 The third game is not a game it is just HD cut scenes from 358/2 Days and it takes just under three hours to watch and takes place after Chain of Memories. 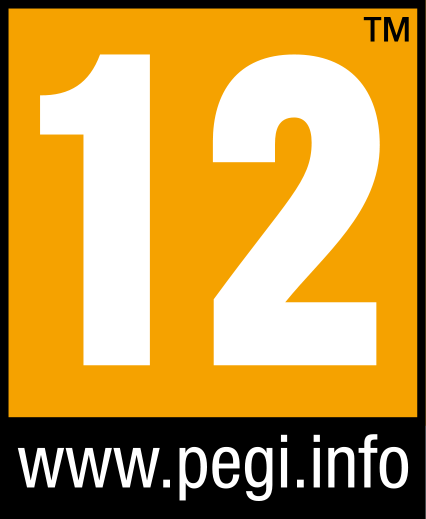 Each game took us between 20 and 25 hours to go through the main storyline. Putting these games together clearly shows us that there will be another Kingdom Hearts HD up date of the other games leading into Kingdom Hearts III. Kept your price under $30.00 because (1) you are only getting two playable games and the cut scenes from the third game and (2) Final Mix is below average because of camera and combat issues.